This afternoon I was sitting on a step in the yard at the center with one of our little boys who was "playing" the mandolin. He stopped "playing" and said, "Hai, April, sing 'He is Lord' with me." You know the tune, the old praise song many of us grew up singing? First, the sentence was in Romanian. Third, I don't know all the words to the song in Romanian. And so I said that to him. Again he said, "Hai, April, He is Lord!" Zach is now the proud owner of a pretty little piece of Romanian pottery to be delivered when I see him in June! Thanks everyone for playing! And it's not too late to become a follower if you haven't already. Plus, you never know when I'll have fun little give-aways or more contests...you're gonna want to be a follower! Next week at our annual staff retreat in Lepsa (see April 2008 posts for photos of this magical place), I'll be hosting a little conversation/talk about listening (where I hope to learn as much as I speak). It's a dialogue about not only listening to God, but to others. I think the two happen to be pretty well related. And so, what is listening all about? Sometimes it feels to me like being a rusty weathered and worn out wheelbarrow, filling up on the words and emotions and thoughts of others that I carry around until I either rust out, a handle breaks, or I dump anything I'm carrying. While I may very well be that old wheelbarrow, I know that listening is much more than this. It's carrying something very precious, holding it, processing it, until it sort of becomes part of me. And those words and thoughts and feelings of another then work to fill up the spaces of my rusted being until I find I'm healed and more whole for the listening. It's an interesting process, too, listening to the words of another language and culture and all the emotions that are carried in the nuances of new letters and speech. I start to listen in a new way, and not always in a healthy way, because as I try so hard to sort verb from suject from pronoun, I find I lose the meaning, the deeper conversation of what a person is saying. Slowly, I find myself sliding in an avalanche of panic realizing that I don't understand what is being said. And the panic becomes about me, about my loss of control in the meaning and comprehension of words. And I lose sight of the other, of the one who is sharing, speaking, giving. I'm beginning to wonder if it's the same way I listen to God. I don't understand, even if it looks like I'm really trying, and so I get scared and hold tightly to what I can comprehend, rather than losing my grip in the interest of everything I can't understand or see or speak. I guess, listening to anyone, Anyone, is a little like faith. And I'm feeling more now than ever, that I need those Words of life to fill in my rusty worn out spaces, to bring healing and hope for wholeness. I was wondering, what are your thoughts about listening? I'd love to hear them! So, please comment below as I could use the input for my discussion. And, maybe in a later post, I'll show the video of the discussion I host. In other news...I'm up to 22 followers!! Thanks to all of you who have joined!!! Only 3 more to go and we reach a prize winner! Can't wait to see who it is! I've been checking out a lot of different blogs lately, and probably the most favorite one I've found is A Holy Experience. Do click on the site name to see the blog for yourself. Her words and photos are simple and amazing. This blogger started something several years ago called A 1,000 gifts. Every Monday she and others post things they're grateful for until they reach 1,000 (or more). At first I rolled my eyes at such a project, clearly my mind and heart are not in the mood to count the things for which I'm grateful. If I'm grateful, that is. And then I remembered something Ron Frost said to me almost 15 years ago. He looked me in the eye and with such strong conviction said: Don't ever stop being thankful, April. My next thought was: I do want to cultivate gratitude in my heart, in my life. Even though it feels sorta hard right now- even though it feels like the antithesis of where I am. The antithesis being that I don't have what I want, what I desire, what I long for and so I don't feel grateful or thankful. And being as honest as that last sentence is, now I feel pretty lame. Because here is still what I know to be true: my God hears, my God sees, my God gives. I've seen this in my own life ~ I can testify to it. And so, I think, that in order to remember what is true, I need to cultivate gratefulness. 1. I'm grateful that after 37 years of singleness, I'm married. 2. I'm grateful that I'm married to Bela. 3. I'm thankful for really amazing family and friends. 4. I'm so glad I'm an aunt. 5. I'm thankful for spring. 6. I'm thankful for vision that gets me up in the morning. 7. I'm thankful for my washing machine and tiny fridge. 8. I'm grateful for food. 9. I'm glad to be growing some herbs and flowers. 10. And after so many years of being single, I'm thankful to be able to try for babies. I'm feeling a little vulnerable after laying all that out there. But, my heart shifted a bit, too, and is finding itself humbled by what I've been given. Maybe you'd like to join me in counting 1,000 gifts? Or maybe in the comment section here you'd just like to say a couple things you're grateful for today...either way, and even if you don't want to, please say hi. Also, don't forget our contest!!! Become a follower of Learning and the 25th follower wins a little piece of Romanian pottery...if you already are a follower and refer the 25th follower, you'll receive a little gift, too! I’ve been following the blog The Inspired Room (click to go to the site!) and I have to say that Melissa (the blogger) is the nicest lady. She corresponded with me a bit, used to live in Portland (like the rest of us who used to live there, she misses it a lot), AND her husband is a Multnomah grad. She asks the question: “What inspired you” every week. Last week I gave it a go, and this week I am again. And then there's the old desk that sits in our bedroom. I 'rescued' it from the drop-in center where it was on its way to the workshop to be used for various carpentry projects. The desk actually was at the drop-in center when we moved in about 7 years ago. The peeling paint, old nails, and shades of blue and green always make me wonder the stories it could tell. Did a woman use it knead bread? Or did a child use it do her lessons? Whatever the tale, it can now tell the one of me and my love as it makes such a sweet addition to our room. Also, if you’re my friend on Facebook, you’ll notice that I’ve been alluding to BIG changes come to the blog. They are. They’re BIG. On the sidebar I’ve given you a little taste of what is upcoming (see contemplation, activism, and Romanian Wifery). I don’t have anything posted under those tabs yet, but I will soon! So keep coming back! I’m looking for at least 25 people to follow my blog…if you are the 25th person you will win a lovely little piece of Romanian pottery. AND, if you are already a follower and are the person who refers the 25th follower, you’ll get a little gift, too! I’ll mail it to you when we get to the states in June. (My husband tells me that this contest won’t work as people won’t become a follower until they can try and be the 25th person and therefore win the contest…he may have a point. But, I say, let’s blow his mind and try and double the number to 50 followers! So, tell your friends, your neighbors, your kids, your grandma and your grandma’s neighbor Nelly). Last week, Bela and I drove from Chisinau to Cluj-Napoca. I could say more about the beauty and heritage found in that drive, but I'll let this video speak for itself. And so, without further ado, the video, accompanied by the music of Romanian composer George Enescu. "I have a feeling I'm gifted in golf." Here he is showing John how to hold a 'golf club' a.k.a. broom. 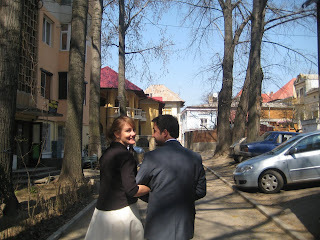 Yesterday I highlighted our trip to a little village outside of Chisinau. It was an hour bus ride away and besides being a little dusty and bumpy, the bus ride to the village was hardly incidental. And the bus ride home was almost as incidental, until we were just inside the city and the bus driver hit his brakes. We were all sitting in the very back, talking, not paying any attention to the driving, so when he hit the brakes, we all had to hold on for dear life to our seats. Adriana let out a little wail. I closed my eyes so I wouldn’t see what was going to happen next. Bela, being the protector he is, threw himself across me so that I wouldn’t get hurt (not really, and although he is protective, there wasn’t any time to think to throw one’s body across another’s. I’m not actually sure what he did. My eyes were closed and I could only hear Adriana wailing). So, when we stopped and I pried open my eyes to make sure nothing catastrophic had happened, I was indeed in for a treat. For John, our at least 6 foot friend, hadn’t slid out of his chair, but the whole chair had slid from its spot! The seat wasn’t bolted into the steel at all! And so, he’d slid off the little hump the chair had sat upon, and into the spot where our feet had just been resting. Picture this, an over 6 foot tall man, still sitting in his chair, which is now sitting where his feet were resting, his knees located just below his chin, eyes open wide in wonder. Of course, my first maternal instinctive response was to ask Bela to take a picture of him. But, out of courtesy to our dear friend, Bela refused. And so, all I have to show you now is where the chair sat in its humble beginnings, and where it ended after John had been ejected. It was truly funny. And if you know John, then, it’s even funnier. (I did ask him if he was okay after I got over my disappointment of not getting a photo). And, a few final pictures from our time in Molova…drinking a spot of coffee,an old door knob and some peeling paint. Since the French have their own shade of blue, I'm thinking of calling this particular hue Chisinau blue. And maybe, when any of us see Chisinau blue, weathered and fading and peeling, we'll think of little stranded hearts caught in a green land, who are reaching for the love of a Father. The WMF team in Chisinau is also working in a village one day a week. Bela and I made the 1 hour bus ride with Adriana and John last Thursday to a Youth for Christ day-center. Kids can come every day for a meal, play time, tutoring, and Bible study. As you can see, Moldova is beautiful...especially in the Spring! We walked down to a field to play a little European football aka soccer. Chained up in the field was a mama goat and her kid feasting on all that yummy spring grass!!! Here's a couple more pictures we took in the village. The doors lead into the day-center and I just thought it was lovely how the wind was blowing the lace curtain. Bela took the one of the old truck...which he loves. And I can see why. Again, I ask that you remember the kids in this village. They are the types who may be heading to an orphanage like I talked about yesterday. Two little girls were especially sweet, walking us back to our bus stop, playing a couple final games with us. My heart ached for them...for their sweetness and innocence and beauty. And in that ache, I found some hope. Because it was the ache of beauty, the kind that makes us long for a better day, the ache that reassures of a leading towards that very day of life after life after death (please read Surprised by Hope by N.T. Wright...it'll make you hope again. Click on title of book to find it on Amazon.). And, here's us. With someone in the background. Gotta love boys. They're about the same no matter where you are in the world. Last week Bela and I drove to the newest WMF field in Chisinau, Moldova. It's not far (only about 5 hours)and it was so good to see our friends again. Everyone on the team in Chisinau has spent time (some of them years) in Galati, so it was like visiting family. This week I'll share some of the highlights of our trip and I'm going to start with a photo Bela took at the orphanage where the team is working. As many of you know, 3 years ago when I packed up and sold my world, I thought I was heading to Moldova. I made a trip to Chisinau with John and David in 2007 and one of the places we visited was an orphanage where John had worked the previous year. In an amazing turn of events, the team is working in this same orphanage now! I say it's amazing because they didn't try and make that happen. In fact, John never even mentioned going back to this place...but, long story short, it's where they are and so evident it's where they are supposed to be. 300 kids from all over Moldova live in this place. Most have been abandoned by parents who have left to work in Italy or Spain. Some parents have died others are in jail. Most of the kids still have some sort of family living in villages that are becoming smaller and smaller as people migrate to big cities or out of the country. The feeling I had when I entered the property was one of extreme heaviness. I know that those who work and run the orphanage really try to do their best, but it was easy to see the task they are up against. Kids getting high, kids quick to hit one another in frustration, and teens who seemed to be 'physically' involved. Basically, in this place, there are children without parents. They have a lot of freedom. And, they've been abandoned. I can't imagine what is going on in their hearts and minds as they reach for other things and people to dull the pain they feel. Bela took this picture of one of the stair wells at the orphanage. They are dark steps, worn through over the years. You can see the layers of paint that have been walked away as child after child wore their childhood away in those halls. Please pray for the team working with these kids. It's a weary work, hard on the heart, hard on the hands, hard on the soul. Please pray for the kids they work with, that in the midst of so much abandonment and pain, true relationships would be forged and that these kids would come to know that God is good. I love that until Ascension Sunday, we're still greeting one another with the good news of Christ's Resurrection. I sort of wonder why we don't do it all year long...in the middle of an icy winter, when it seems all hope is lost and I'll never feel the warmth of the sun again: Christ is Risen! Truly, Christ's resurrection is our hope. Our legal marriage happened one year ago. While it wasn't the 'true' wedding or our covenanting before God, it was, still, a commitment we made to one another that day 'til death do us part. There was no turning back from that day forward. As such, it deserves a bit of celebrating and down at the ranch I call it "Triple 'C' Day". (Not really, we don't have a ranch). Here's a photo from one year ago when Bela picked me up and we were walking to the car. And, a photo from the other day before we went out for pizza to celebrate (pizza is a theme around here). Sadly, I've not one snap-shot (can you still call digital photos snap-shots?) of our own little celebration. Suffice it to say, Indian food was eaten, presents were opened, and fun was had by all. I met Liz when she was a mere 18 years old (or was it 17 about to be 18? )en route to Kolkata 5 years ago. I loved her immediately. She's super smart, thoughtful, caring, hilarious, and an all around amazing woman who you should know if you don't already. Today, we both serve with WMF and in late January she and some others made a field visit to Galati. Here, we are enjoying a caffeinated drink after some pizza. If you'd like, you can visit Liz at her blog, Life of Liz, reachable by clicking on the link right there to the right under my friends. This week has been a hard one. Boys that I was bribing into coming to the center all this week decided not to cash in, and so we won't be going to the mountains with them tomorrow. I found out that the twins I've been working with won't be returning to the center, either. Their mom believes they know how to read well enough now and don't need to come anymore. And so, two hard disappointments for me. On top of others. Then, there was this: by His wounds we are healed. And as I sat in church, thinking about these words, I saw the faces of the kids I love. Boys struggling with street-life, who find the freedom it offers so attractive, but are unaware of the prison it can become. Kids abandoned by their parents. Kids who at 9 years old know how to read well enough. Children who have lost both their parents in the last 2 years. Others who soon may no longer have a home. I saw these faces in the wounds of Christ, and then I saw my own face, too. I think for the first time I am understanding what these words mean. As my own heart breaks under the weight I carry for the kids I love, I also struggle with my own brokenness, recognizing how much I need healing. I pray anew, that we would find healing in His wounds. That we would find ourselves in those spots left raw and bleeding on the body of Jesus. They are our healing. And the resurrection, our hope.